Come and meet the team at Forty Acre Plantation Lakes in Essex and see the latest methods, rigs and fish care. We have two lakes which are set in peaceful surroundings of 132 acres of woodland. The main lake is 4 acres, whilst enjoying the surrounding countryside anglers can also expect a good day’s fishing. Our well stocked main Lake has an excellent range of selected species including Common Carp, Specimens up to 36Lbs. 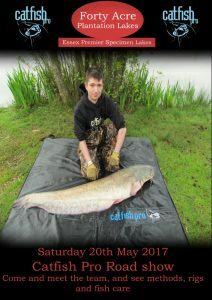 Mirror Carp, Specimens up to 32Lbs Barbel 5Lbs and Catfish up to 88lbs. We also provide good facilities including excellent access and parking, access to our well cleared and kept bank side swims is maintained with the Angler in mind and for the convenience of all visitors to Forty Acre Plantation Lakes there is onsite flushing Ladies and Gents toilets. 24 hour CCTV is in operation to make our fishery as secure as possible, please help us to help you by keeping your tackle nearby and secure. Food and beverageis available from local takeaway’s who will deliver to the fishery (information available from Barry the Bailiff.) On Sundays there is Simply the best snack bar open selling hot & cold food. For emergency Tackle requirements Barry will direct you to a nearby shop.